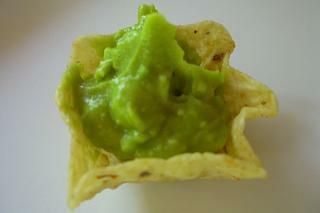 To make Guac & Chips, wash 3 fully ripe Haas avocados and cut in half length-wise (twist in opposite directions to split). Remove seed from each avocado and peel using your fingers. In a large food storage container that has a lid (or you can use a bowl and plastic wrap), mash avocados with a fork. Mix in 5 Tbsp of finely chopped Vidalia onion, 3/4 tsp salt, the juice of 1 lime, and freshly ground pepper. Put lid on the food storage container and refrigerate until cool (about 1 hour). Serve with Tostitos Scoops. The guac paired with the deep chips was a good match. The guac had a nice hint of lime, too. Nutrition note: Avocados contain about 20 important nutrients and contain monounsaturated fat (the good fat). 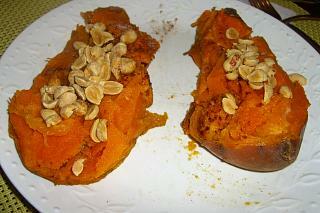 Jamie says: I came up with a new sweet potato recipe- the nutty sweet potato! I love the combination of sweet and salty, so I added sugar and nuts. Here’s my recipe: Put a washed sweet potato in an aluminum foil “boat.” Add water to the bottom of the “boat” and pinch closed. Bake for at least one hour at about 375 degrees Farenheit or until soft. (If it is not done and you don’t want to wait anymore, try microwaving it for a few minutes.) Cut sweet potato in half and add Smart Balance Omega 3 Buttery Spread, sugar, cinnamon, and dry roasted lightly salted peanuts on top. The nuts add some protein and a nice crunch. Delish! Nutrition note: Sweet potatoes are high in vitamin A (from beta carotene), vitamin C, and fiber. Eat the skin for an extra fiber boost. Jamie says: I threw a girls’ night dinner party to catch up with some of my friends during my first week of summer classes. Chili and cornbread were on the menu. This dinner had quite a few interesting stories. Let’s start with the first one: #1) When I was making the cornbread, there was NO corn in the can of corn- all liquid, no corn! So I had to go to Publix for the third time this week, which is unheard of. (I decided to go with the trusted Del Monte brand this time instead of the Publix brand.) #2) This was my cousin Lauren’s first time ever eating chili. #3) This was my friend James’ last meat meal. (Ironic. I made my friend Heather her first meat meal, and now I was making James her last meat meal.) #4) The chili recipe said it served 2, so I doubled it and added extra sauce… however, it probably made 14 servings, so I now have enough chili in my freezer to feed a small village. Cornbread (modified from my mother’s corn souffle recipe): Mix 1 box of Jiffy cornbread mix, 1 can of kernel corn, and 1 can of creamed corn (do NOT drain juice from either can) in a 13 x 9 inch baking pan sprayed with PAM cooking spray. Put slices of Smart Balance Omega 3 Butter Spread on top. Bake for 55 minutes at 350 degrees Farenheit. 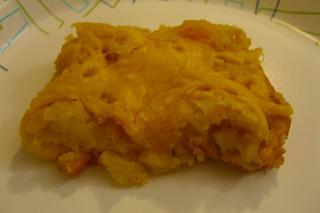 Add shredded reduced fat sharp cheddar cheese and cook for an additional 5 minutes. 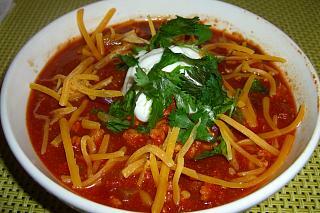 Chili: Recipe adapted from The bon appetit cookbook. I’ll give you the recipe to “serve 2.” In a large pot, heat 1 1/2 Tbsp canola oil and 1 large, chopped onion on medium heat for 5 minutes (stir). Add minced garlic from 3 large cloves and cook an additional 5 minutes (stir). Add 1 lb of ground pork, salt, and pepper, and cook until meat is no longer pink. Add 1 1/2 Tbsp chili powder (stir and cook for 1 minute). Add 1 large can of crushed tomatoes with added puree, 1 can kidney beans (no liquid), and 2 Tbsp tomato paste (stir). Cook, covered, over low heat for 30 minutes (stirring occasionally). Serve with shredded cheese (use same bag from cornbread recipe), reduced fat sour cream, and fresh cilantro. It seemed as though everyone enjoyed dinner and everyone’s company. It was a fun night. Nutrition note: Beans are a good source of fiber. Among other benefits, fiber fills you up and keeps you full. A 1/2 cup of kidney beans has about 7 grams of fiber, which is about 1/4th of the daily recommeded intake. Jamie says: I love breakfast. And those of you who know me pretty well know I love cereal, too. 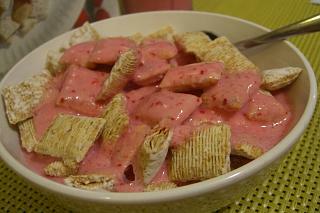 This morning, I wanted to do something different with my shredded wheat, so I made strawberry milk and added it to the cereal. It was fun eating cereal with pink milk, and it was quite tasty, too. There’s no added food coloring either! To make strawberry milk, blend strawberries, ice cubes, milk, and honey together in a blender. Pour over cereal, such as Publix Frosted Wheat or serve as a beverage. Nutrition note: Publix Frosted Wheat is a good source of vitamins and minerals, especially iron. The vitamin C in the strawberries increases iron absorption, too. Iron is important for red blood cell production and preventing anemia. Kathryn says: My friend Amy hosted another lovely dinner party, and, being the stellar cook that she is, I didn’t want to show up with a bag of chips. I knew she’d appreciate something from scratch. 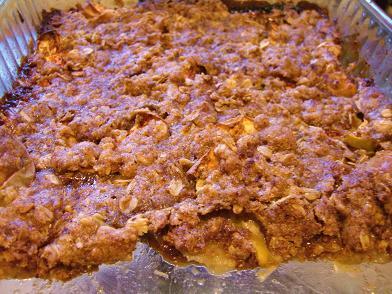 I had a bunch of green apples in the fridge and a craving for oatmeal, so I decided to bake an apple oatmeal crisp. I modified this recipe from Cooks.com by using Smart Balance instead of butter, keeping the skin on the apples (I like the taste), and replacing lemon juice with Dole Pineapple-Orange Strawberry juice (I didn’t have a lemon). I liked the crunch of the spiced sugar and oatmeal on the soft apples. It tasted like a sweet, old-fashioned comfort treat to me. And Amy and her guests seemed to enjoy it too.